A squealing dishwasher is not only annoying — it indicates that something might be malfunctioning within the motor or the pump. In some cases, the squealing will stop after a cycle or two, but squeals that are continuous or that persistently come and go should be addressed. To determine where the noise is originating from, you'll have to inspect the motor, pump and inlet valve. Squealing from a new dishwasher is not uncommon because the motor bearings are dry. Examine the bottom of the unit. If you notice water leaking beneath your dishwasher, it is likely that you have a spin seal leak, which can allow water inside the motor. This washes away the bearing grease and can result in a squealing noise. Replace the motor if you have a leaking spin seal because spin seals cannot be repaired. Replacement motors for most major brands are available at appliance parts stores. If your dishwasher is still under warranty, contact your manufacturer. Inspect the motor and pump housing, which is located on the bottom of the dishwasher. Use a flashlight to see all parts clearly. Look for a disc called a slinger, which is attached to the top of the motor. This can break off and spin around the shaft while it turns. If this is broken, the motor will have to be replaced. Open the pump, which is located with the motor, and inspect it for debris that might be causing the sound. Occasionally a small object, such as a piece of food, a bone or a broken dish fragment, can get stuck in the pump of your dishwasher. If there are signs of damage from the obstruction, you may have to replace the pump. Unplug the dishwasher, or turn the power off at the breaker. Remove the kick plate from the front of the dishwasher and locate the inlet valve, which is usually on the right or left side. Check that the hoses have a good connection and that there are no bends or kinks to restrict water flow. Tighten any loose connections and replace any kinked hoses. Disconnect the wire connectors from the valve. You may want to label these so you reconnect them properly. 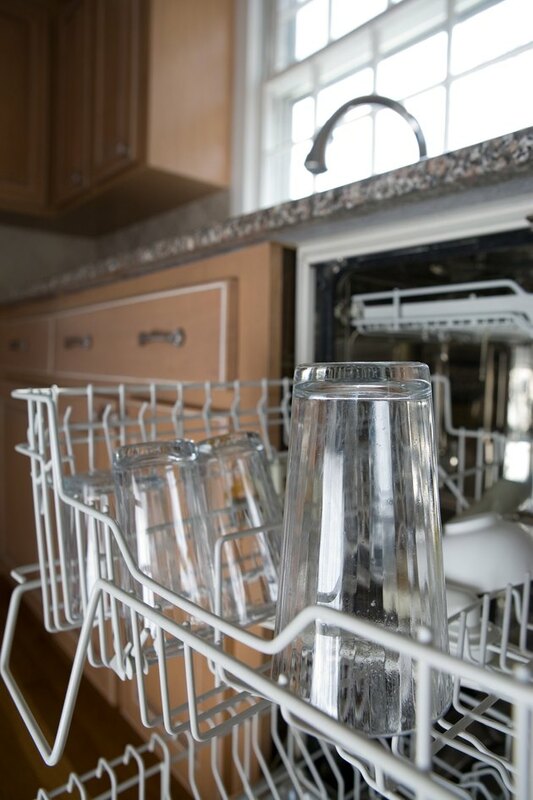 Most dishwashers will have two or four wires connected to the inlet valve. Set a multimeter to its lowest ohm setting, and touch each probe to a solenoid terminal. If it shows a reading of 0 ohms, then the valve is fine. If the reading doesn't change or shows a reading of 2, then the valve should be replaced. You can purchase inlet valves at most appliance parts stores.